'Hang on to the programmes. They'll be worth something - the match that never was', was former Ireland coach Eddie O'Sullivan's parting shot as he left the press room at the Stade de France after the postponement of the France v Ireland match a couple of weeks back. It remains to be seen whether the ground authorities issue a new programme for the replay - which would make those produced for the original match a collector's item - or reason that with only three weeks between the scheduled and rearranged dates, they can make do with the original. And assuming that no further mishap overtakes the fixture the game will move from the 'never was' category into the list of matches which - like those shifted by the weather in the 1980s or Foot and Mouth at the beginning of this century - were merely postponed. To find the tournament's last authentic matches that never were you have to go back 40 years exactly - to the 1972 tournament and the Ireland home matches that were cancelled. It was the worst year of the Northern Ireland 'troubles' with a death roll close to 500 including the 'Bloody Sunday' killings of peaceful demonstrators in Derry on January 30. 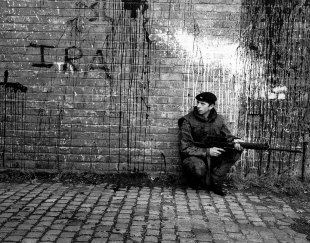 It was also the one time that it seemed possible the troubles might spread beyond Northern Ireland and the border areas to take in Dublin and other parts of the Republic. In the days after 'Bloody Sunday' demonstrators - reckoned to number about 20 to 30,000 - besieged the British Embassy on Merrion Square in Dublin and on February 2 succeeded in burning it down. Scotland, due in Dublin on February 26 to play an Irish team that had already won in Paris and London, were unnerved. John Taylor reports in his book on rugby in the 1970s that several players received death threats purporting to come from the Provisional IRA. On February 14, the Scottish Rugby Union announced that its team would not travel. The Irish Rugby Football Union sent a high-powered delegation including its leading officials and national coach Ronnie Dawson to Edinburgh in the hope of getting the SRU to think again. They did so, but after a further meeting on February 17 confirmed that they would not be coming. The same process followed in relation to the match against Wales, due to be played on March 11 - potentially, since Wales had won their first three matches, a winner-takes-all decider for Triple Crown, Championship and Grand Slam. Taylor records that some Welsh players had also received threatening letters and that 'a couple were unsettled' but 'most of us were quite prepared to go'. The Welsh Rugby Union suggested that the match might be played in Cardiff or on a neutral ground, but the IRFU insisted that it was Dublin or nothing - and on February 27 it was called off. The two cancelled matches - and in particular the possible climax against Wales - remain among the great might-have-beens. Taylor wrote that 'there was not a player in the 1972 side who did not believe that we would have recorded our first win in Dublin since 1964'. For the Irish, without a Triple Crown - or many near things - since their Grand Slam year of 1949, the disappointment was particularly grievous. Willie John McBride, who reckoned the 1972 team possibly the best Irish combination he played in, wrote that 'I found it hard to understand the attitude of the Scots and Welsh', adding that many of their players had not agreed with the administrators. It was the French who earned the undying gratitude of the Irish in April when they sent a team over for a non-championship international, intended to give the Dublin public some taste of top-class rugby and also help repair the financial damage of the cancelled matches. Ireland won the extra match, but could be argued to having been paying back ever since - France have won 35 of the 44 meetings since 1972. "It was the French who earned the undying gratitude of the Irish in April when they sent a team over for a non-championship international, intended to give the Dublin public some taste of top-class rugby and also help repair the financial damage of the cancelled matches." The 1972 cancellations were the first since 1914, when Scotland refused to play France after a riot at the end of their match in Paris a year earlier. That was the last time (other than the Home Nations collective defenestration of France from 1932 to 1939) that any nation invoked the sanction of 'cutting off the fixture', which was applied rather more frequently in the championship's early Victorian days. Only two seasons - 1884 and 1887 - were completed unscathed during the 1880s, and the rumblings following the 'Gould affair' left the championship unfinished in both 1897 and 1898. Van Esbeck and other Irish observers compared the behaviour of Wales and Scotland unfavourably with teams who turned up unfailingly to fulfil fixtures while modern Ireland was going through its violent birth pangs in the early 1920s. France's Marcel Lubin-Lebrere was arrested by the British army in 1920 - out on a walk through Dublin he heard the Marseillaise being sung 'not very well', and located the Sinn Fein detachment doing the singing at almost the same time as the soldiers, who took a great deal of persuading that he was an innocent bystander rather than something new and exotic in the way of Irish subversion. Two men were killed outside Wales's hotel in 1921 and in 1923, when the Welsh Rugby Union insured the lives of their players for £1000 a man, winger Rowe Harding recalled 'the armoured cars hurrying through the town, the search parties holding up pedestrians to search for firearms and the rifle shots which broke the silence of the night' and how 'a card party was abruptly terminated by the staccato notes of rifle-firing outside the hotel'. The difference was probably one of context. The players - and very often the officials - of the 1920s had just come through a war. Lubin-Lebrere had lost an eye, one of five such victims spread across the two sides who account for France's first post-war fixture against Scotland being known as le match des borgnes, the one-eyed match. After losing five seasons, friends, team-mates and sometimes vital body parts, they were determined not to let anything else, even a civil war, stop them playing. The men of the 1970s had an understandably different perspective.